When I was growing up, I was never told to eat my brussels sprouts. Or my lima beans. Or my parsnips. This isn’t because I was some infant prodigy vegetable lover, but because these vegetables, and many others, never graced our family table. My father, who is a gourmand in many other ways, has a decided aversion to most vegetables. (He claims he’s allergic to beets, having developed a rash when fed them at the age of two. He has not eaten beets in the intervening sixty years. I am skeptical.) We did have a green salad almost every night with dinner, and my mother does make the world’s best Caesar salad, but I never encountered kohlrabi or rutabagas until I was all grown up and eating them in my own kitchen, so I never developed a distaste for those little beauties. Because of my sheltered childhood, I have a strong and lasting love for cruciferous vegetables – those strongly flavored, cancer fighting, generally awesome brassicas that are despised by children the world over. Bring on the Brussels sprouts! Cue the cauliflower! 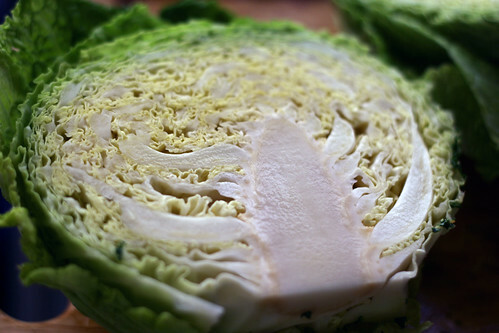 Of all the cruciferous vegetables, I would say cabbage might just be my favorite. It’s versatile, performing equally well in salads and stir fries, it’s sweet, and salty, and perfectly crunchy, and best of all, it lasts a good long time in my refrigerator drawer. 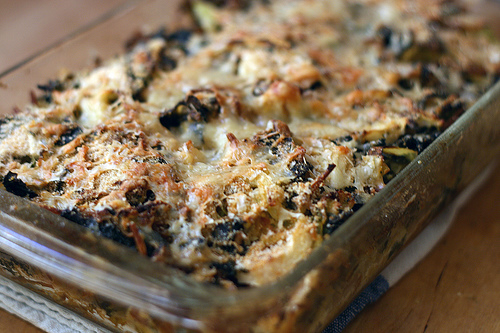 That is why when I saw the recipe in the New York Times for kale and cabbage gratin, I knew I hit the jackpot. Cabbage! And Kale (another Brassica, and the healthiest vegetable)! And I’m not turning up my nose at Gruyere either. The recipe is fairly straightforward. Start by chopping an onion. 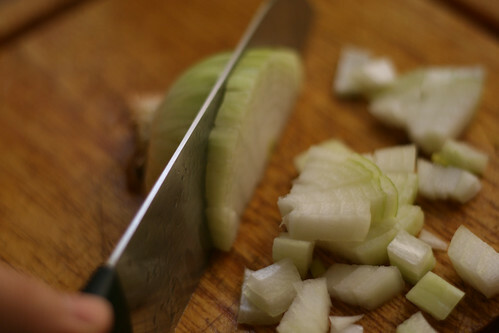 Have I told you the easiest way to chop an onion? No? 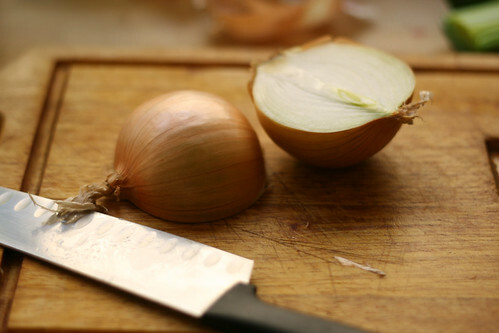 I think this is the opportunity for cooking 101 – chopping an onion. 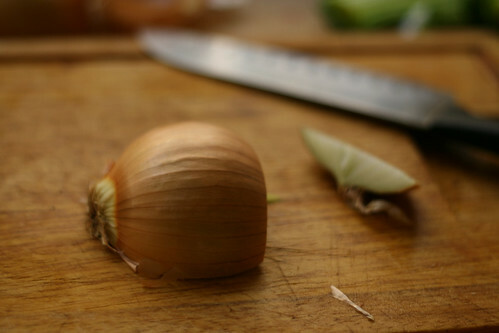 Get an onion (papery outer layers removed), a cutting board, and a knife. 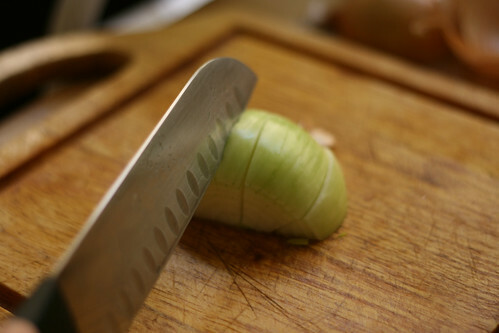 Slice the onion lengthwise, as pictured. Lay the onion flat side down on the cutting board. Peel off the outer layers (any remaining papery skin) and remove. 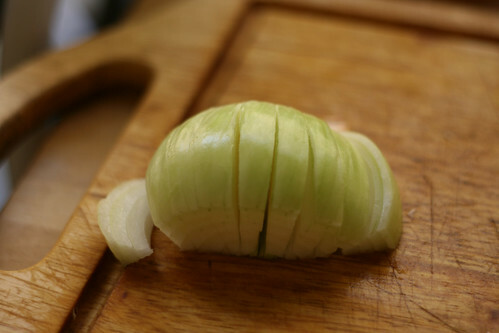 Make vertical slices in the onion. 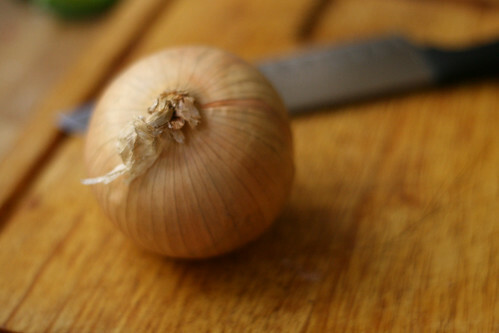 Rotate 90 degrees, and make horizontal slices in the same onion. Repeat Steps 3-5 with other half of onion. Voila, you’ve just chopped the onion! 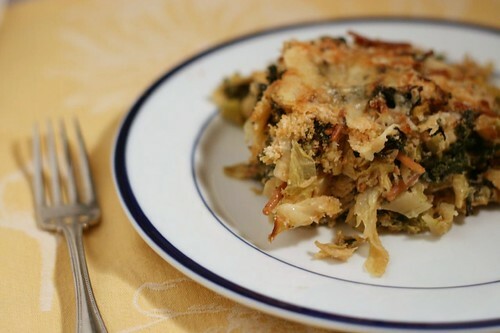 Prepare the kale and cabbage – remove the stems from the kale, and the core from the cabbage. See that white part in the middle? That’s the core. 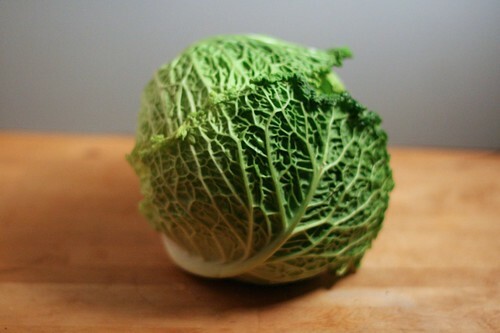 Aren’t cabbages pretty? Saute the onions in olive oil with some garlic, add sage and herbs de provence, wilt the cabbage and the kale, add eggs and cheese and rice for a binder, top with breadcrumbs and bake. Of course, I realized after I began cooking that I was plum out of rice (note to self: Check pantry BEFORE you start cooking. And preferably while making grocery list) so I searched high and low to come up with a replacement ingredient. One of my favorite cookbooks – the Zuni Café Cookbook – came to the rescue with a recipe for fideus, basically noodles that are cooked like a risotto. 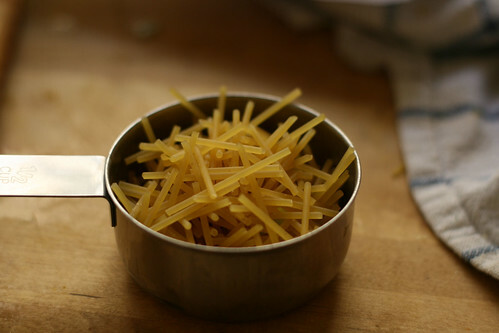 To make the fideus, I broke spaghetti into segments about ½ inch long. It doesn’t matter how exact. And don’t try to cut them with a knife. I did. Breaking is easier, and takes about 30 seconds. You should have about ½ c. broken noodles for this recipe. Then, toss with just a smidge of olive oil, and toast at 325 degrees until the noodles are golden brown. I used my toaster oven. Here are the golden brown noodles. I recognize this picture is not in focus, but I thought it was necessary to show you the color. The recipe called for cooked rice, but I didn’t want to go to the trouble of cooking the noodles separately, so I just tossed them with the vegetables and added some extra liquid for the noodles to absorb. 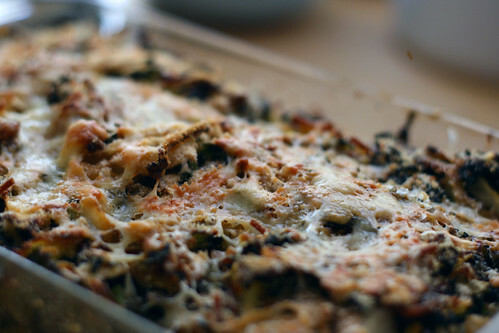 The finished casserole was 1) cheesy 2) healthy and 3) full of cruciferous goodness. You can also make this the day before and reheat in a 350 degree oven. If you work until all hours of the night, like I do. 1 pound plain old curly kale, washed, stems removed, cut into ribbons (roughly. We’re not going for julienned kale, here. Just take the leaves and run your knife through them). 2 tablespoons olive oil (spring for the extra virgin here). In a large pan with a lid (I used a 3.5 quart dutch oven and wish it had been a little bigger), heat the olive oil over medium heat. 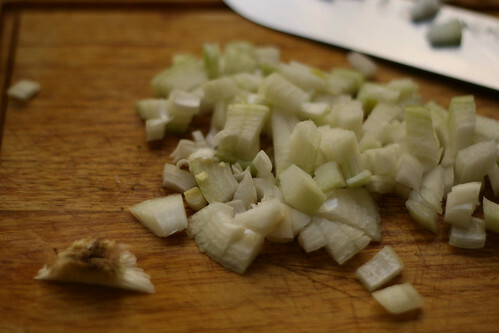 Add the chopped onion, and cook, stirring until the onion is translucent. Add the garlic, sage and herbes de provence, and cook for a minute or so or until it smells really really good. Stir in the kale and sprinkle over it about ½ teaspoon salt. Cover, and cook until the kale begins to wilt (stir frequently). When most of the kale has wilted, add the cabbage and a little salt. Cover and cook, stirring periodically, until the cabbage is wilted. Add salt and pepper to taste. Beat the eggs in a small bowl. Add the beaten eggs, 2 oz. of the Gruyere, the fideus and ½ c. water to the vegetables in the pot. 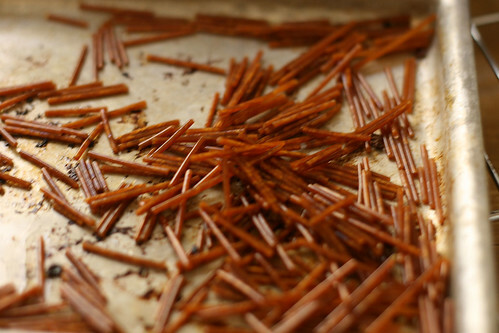 Stir until combined, and scrape into an oiled baking dish. Sprinkle the breadcrumbs and the remaining cheese on top. Bake 40 minutes. This can be served hot or warm, and can be covered and refrigerated until the next day. Oh, the smell of cabbage brings back terrible memories of that stink funkifying the neighborhood on St. Patricks day. Even though I won’t cook with cabbage, I still love your pictures and posts. ps fideus totally puts me in mind of Rice A Roni. Which is one of the very few things I will NOT eat, though I have no idea why not. Hell, I lap up brussels sprouts, so what’s so wrong with a little rice and some roni? More kale. I love it! This sounds great! I love gruyere — and cabbage — but I’ve never had them together. Hmm.